Massive Open Online Courses (MOOCs) are touted by some as a means to transform teaching and learning for the 21st century, presenting an opportunity for global, open learning. Understanding this new, evolving landscape and its potential to make learning more accessible and affordable should be a priority for LIS professionals, as they are influential actors in teaching and learning environments. The papers and presentations listed on this page explore the MOOC as a potentially disruptive and transformational mechanism for large-scale learning. In September 2013, the San Jose State University’s School of Information launched its first massive open online course (MOOC), the Hyperlinked Library MOOC (#hyperlibMOOC). The course was taught by SJSU SoI Assistant Professor Michael Stephens and SJSU SoI Lecturer Kyle Jones as a professional development opportunity for a global cadre of LIS practitioners in various stages of their careers. A selection of the papers and presentations referenced on this page describe what LIS professionals took from the experience and how they might serve students in radically changing learning environments. Stephens, M. (2013). “MOOCs for LIS Professional Development: Exploring New Transformative Learning Environments and Roles,” Internet Learning. Stephens, M. (2014). “Lessons from #hyperlibMOOC,” Library Journal. Stephens, M. & Jones, K. M. L. (2014, April). “Emerging Roles: Key Insights from Librarians in a Massive Open Online Course” proceedings of 16th Distance Library Services Conference, Denver, April 2014. 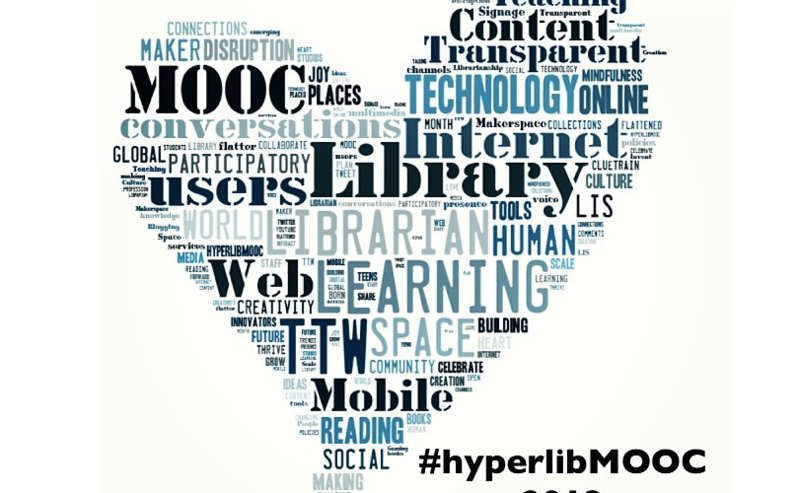 September 30, 2013: “The Hyperlinked Library MOOC,” Pushing the Envelope in Education. Roles for Libraries – MOOCs, eLearning & Gamification, Toronto, Ontario, Canada. October 16, 2013: “Learning 2.0 Meets MOOC: Professional Development Evolves” The Digital Shift: Reinventing Libraries, online. October, 2013: “Learning Everywhere: Transformative Power of Hyperlinked Libraries,” Keynote address presented at New Zealand Library Association Conference (LIANZA). Victoria University of Wellington’s School of Information Management. Hamilton, NZ. March 13, 2014: Hyperlinked Learning Experiences at Public Libraries: MOOCs & Beyond, Public Library Association Conference, Indianapolis, Indiana. April 11, 2014: Learning Everywhere: Of MOOCs & Mayhem, Texas Library Association Conference, San Antonio, Texas. June 8, 2014: MOOCs Panel. Special Libraries Association Conference, Vancouver, British Columbia.